Results on Wednesday: ITC, Bharti Infratel, InterGlobe Aviation, Vijaya Bank, Premier Explosives, Indoco Remedies, Raymond, Navin Fluorine International, Sintex Plastics Technology, Mafatlal Finance, Hathway Cable & Datacom, Dishman Carbogen Amcis, Orient Paper & Industries, Radico Khaitan, Tejas Networks, BASF India, Essel Propack, Wendt (India), Vijaya Bank, Ujjivan Financial Services, Oriental Hotels, Mafatlal Finance, Pidilite Industries, Can Fin Homes, Everest Industries, JM Financial, DB Corp, United Spirits, Bank of Maharashtra, Tanla Solutions, Kewal Kiran Clothing, Thirumalai Chemicals, Reliance Communications, Atlanta. Reliance Industries: Competition Commission of India approves acquiring stake in Den Networks and Hathway Cables. ICICI Prudential Life Insurance Company Q3: Profit falls to Rs 296.77 crore versus Rs 452.10 crore; new premium income rises to Rs 7,483 crore versus Rs 6,795 crore YoY. Walchandnagar Industries: Company and Indian Space Research Organization’s Vikram Sarabhai Space Centre (VSSC) entered into a contract whereby company will manufacture and supply ‘S – 139 End Segments’ for the Polar Satellite Launch Vehicle (PSLV) programme. The contract value is Rs 96 crore plus escalation and is likely to be executed over a period of three years. IL&FS Transportation Networks: Interest due & payable on January 22 was not paid to debenture holders due to insufficient funds. Genus Power Infrastructures Q3: Profit jumps to Rs 23 crore versus Rs 13.2 crore; revenue rises to Rs 292 crore versus Rs 200 crore YoY. HDFC Standard Life Insurance Q3: Profit rises 18.5 percent to Rs 245.63 crore; first year premium increases 4.1 percent to Rs 1,252.34 crore YoY. Infosys: EdgeVerve Systems launches AssistEdge Discover to unlock the true value of automation. Entertainment Network (India): Company fully repaid the unsecured commercial papers (CPs) with a maturity value of Rs 110 crore issued on January 23, 2018. RS Software Q3: Loss at Rs 6.5 crore versus loss at Rs 7.2 crore; revenue rises to Rs 17 crore versus Rs 14.7 crore QoQ. Sacheta Metals: Company received contract worth Rs 36 crore from Mozambique & Rs 6 crore contract from Berbera & other countries. Titagarh Wagons: Subsidiary Titagarh Wagons AFR, France (TWA) appointed Loïc Dubois as CEO. Cupid Q3: Profit falls to Rs 2.03 crore versus Rs 4.09 crore; revenue drops to Rs 10 crore versus Rs 20.6 crore YoY. Visa Steel Q3: Loss at Rs 53.7 crore versus loss Rs 30.7 crore; revenue falls to Rs 370.6 crore versus Rs 386.4 crore YoY. Limited (formerly Kirloskar AECOM Private Limited). Cyient: Company signed a definitive agreement to acquire the remaining 26 percent stake in one of its subsidiaries Cyient DLM Private Limited. Maharashtra Seamless: Board approved acquisition of 13,39,07,903 equity shares of Rs 10 each (100 percent) and 36,34,92,500 Preference Shares (100 percent) of USTPL, in compliance of the Resolution Plan of the USTPL approved by NCLT. IL&FS Engineering and Construction Company: Company received a termination letter from Jharkhand Bijli Vitran Nigam Limited informing the company of the decision of the competent authority to terminate the contract for IPDS Dhanbad Package. Thomas Cook: CRISIL reaffirmed long term rating at AA-/Stable for bank loan facilities and removed from Rating Watch with Developing Implications. Syngene International Q3: Profit rises to Rs 87 crore versus Rs 82 crore; revenue increases to Rs 467.1 crore versus Rs 387.7 crore YoY. Oberoi Realty Q3: Profit rises to Rs 138 crore versus Rs 120.2 crore; revenue jumps to Rs 528.6 crore versus Rs 356.2 crore YoY. VA Tech Wabag: Company secured Rs 467 crore worth order from Mangalore Refinery and Petrochemicals towards engineering and construction of a 30 MLD sea water desalination plant expandable upto 70 MLD in Mangaluru, Karnataka. Shriram Transport: Company raises Rs 500 crore via NCDs. Prabhat Dairy: Alquity Sicav – Alquity Indian Subcontinent Fund sold 16,00,846 shares of the company at Rs 86.56 per share on the NSE. Sri Krishna Metcom: Pratyush Foods Private Limited sold 70,000 shares of the company at Rs 69.8 per share on the NSE. Vivimed Labs: ECL Finance bought 2,13,345 shares of the company at Rs 26.25 per shares on the NSE and 1,43,522 shares at Rs 25.28 per share on the BSE, while it sold 10 lakh shares of the company at Rs 21.35 per share on the NSE and 10 lakh shares at Rs 21.25 per share on the BSE. SKS Fincap Pvt Ltd also sold 5 lakh shares at Rs 21.35 per share on the NSE. Page Industries: Nalanda India Fund Limited sold 1,85,000 shares of the company at Rs 22,161.05 per shares on the BSE. Lemon Tree Hotels: Board meeting is scheduled on February 13 to consider the unaudited financial results of the company, both on standalone and consolidated basis for the quarter and nine months ended December 2018. Tata Steel: Company’s officials will be meeting mutual fund houses on January 23. Oriental Bank of Commerce: Board meeting is scheduled on January 29 to consider the reviewed financial results of the bank for the quarter / nine months ended December 2018. 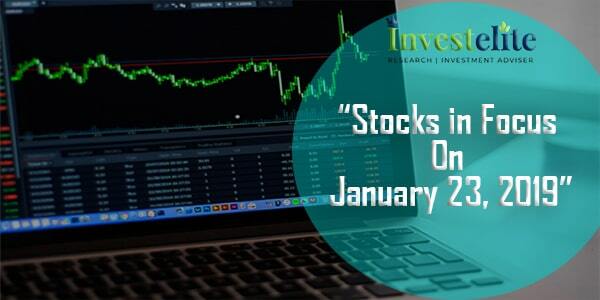 Supreme Industries: Conference call for analyst and investors to be held on January 24. Alembic: Board meeting is scheduled on January 30 to consider the unaudited financial results of the company for the quarter and nine months period ended December 2018. Orchid Pharma: Board meeting is scheduled on January 29 to consider the unaudited financial results for the qarter ended September 2018. Setco Automotive: Board meeting is scheduled on February 11 to consider the unaudited standalone financial results for the third quarter and nine months ended December 2018. Vishal Bearings: Board meeting is scheduled on January 31 to consider the issue of bonus shares. Hinduja Ventures: Board meeting is scheduled on February 7 to consider the un-audited standalone financial results of the company for the quarter and nine months ended December 2018. Indian Energy Exchange: Company’s officials will be meeting SBI MF on January 23. Shemaroo Entertainment: Board meeting is scheduled on January 30 to consider the unaudited standalone and consolidated financial results of the company for the quarter and nine months ended December 2018. Dishman Carbogen Amcis: Company has arranged Conference Call with investors on January 24 to discuss the financial result and performance of the company for the quarter ended on December 2018. Jagran Prakashan: Board meeting is scheduled on February 1 to consider the financial results for the quarter and nine months ended December 2018. The Investment Trust Of India: Board meeting is scheduled on February 1 to consider the un-audited financial results (stand-alone and consolidated) of the company for the quarter and nine months ended December 2018. REC: Board meeting is scheduled on February 8 to consider the un-audited financial results of the company for the third quarter and nine months ended December 2018.Aavas Financiers: Conference Call to be held on January 31 to discuss with the investors the financial and operational performance of the company for quarter and nine months ended December 2018.